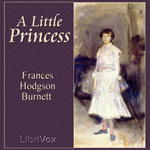 The Little Princess by Frances Hodgson Burnett – It's Time to Read! When Sara Crewe, the seven-year-old daughter of a rich and loving father, arrives at her new school in London from India, she is nicknamed the Little Princess by her classmates. She has all the comfort and fine things she could want, but she also reveals a kind and loving heart, a lively mind and a rich imagination. When her father dies, bankrupt, Sara is suddenly reduced to a life of poverty and is forced to live in a cold, damp attic, with only her dreams to support her. But will they be enough? I remember seeing this film when I little with my Granny, and I remember really enjoying it (and also it making me cry!) I was excited to read this book, having such fond memories of the film – and I must say, I loved the book! I listened to it – a download from Librivox, and it was well worth downloading. The story is fairly well known: little Sara is beloved by her father but sent to a school in England, away from him. He dotes on her and makes sure she has all the luxuries she needs. That is until he dies and it becomes clear that his latest venture into diamonds had not paid off and he was left bankrupt. Sara soon finds herself an orphan who is living in awful conditions in the attic of the school working as a servant. But her luck is set to change, thanks to her mysterious next door neighbour. This is a touching story of a little girl’s endurance. I loved Sara. She included others and made them feel loved. She was able to persevere through life thanks to her amazing imagination and her ability to face whatever is thrown at her. And I loved her friends. Even when Sara was banished to the attic she had girls come up and visit her – she was still a princess to them. They are a lovely bunch of girls. This is a children’s book and I imagine I would of loved this when I was little, like I loved the film. As an adult, I really enjoyed this story and am happy to recommend it to adults as well as children. Top marks from me! This is a great review for a great book. The Little Princess holds a fond place in my childhood memories. I found this book inspiring, and beautiful, and perfect in every way. Sara, of course, was the best part about this book. How would you rate the movie as compared to the book? I hate movies which spoil my memories of immortal books so I’m usually cautious about watching book-adaptations and I am interested in knowing whether the movie is worth watching.